Our beloved Pats haven’t reached the Super Bowl, but you and your friends can still gather to watch the game. Serving cocktails during the football game or any party doesn’t have to be stressful – a self serve bar is a great idea where guests make their own drinks. 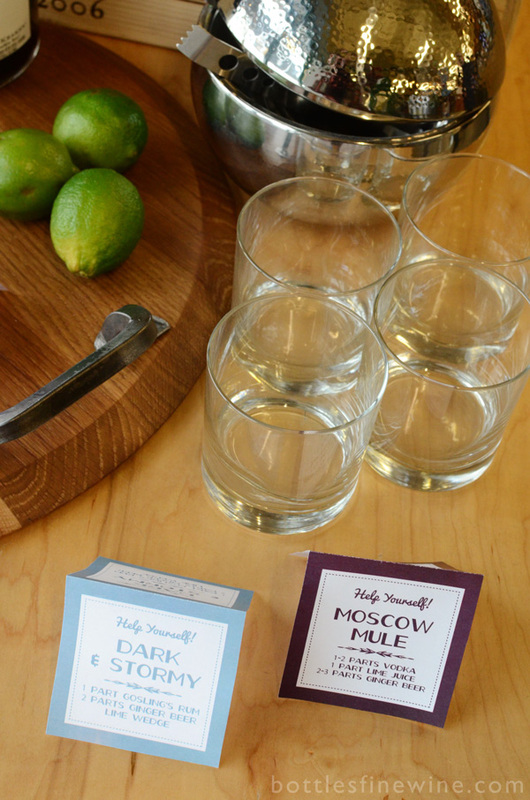 What’s better than a DIY bar for a party, complete with drink ideas? 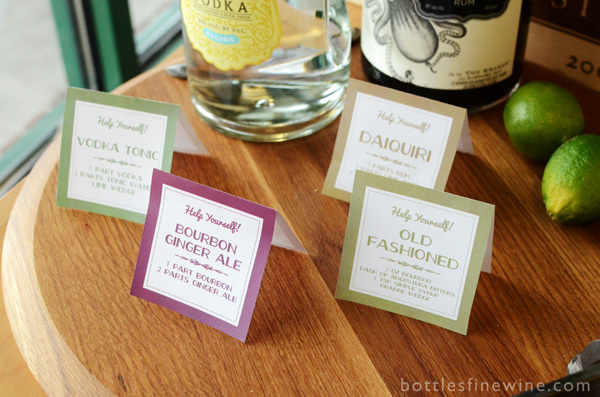 Learn how to set one up, and use these free printable cocktail recipe signs. This download has 6 easy cocktails; all you have to do is set them at the bar! This is a great way to entertain for not only the game, but for birthday parties, bachelor & bachelorette parties, graduation, summer bbq’s, family reunions, and almost any celebration. What to serve with your jalapeno poppers, buffalo wings and famous spinach dip? Beer of course, but cocktails are great too! You can serve cocktails and not miss any crucial moments of the game. Drink mixing should be limited to time-outs or commercials, so you need something quick, classic and with as few ingredients as possible. Greet your guests with a cocktail, but also set up a self serve bar in your home arena so as not to lose a minute of action. – Have an ice bucket with tongs, a cocktail shaker, bottle opener, bar spoon, and rocks glasses. – For mixers, have Angostura bitters, simple syrup, ginger ale, club soda, tonic water, and ginger beer. 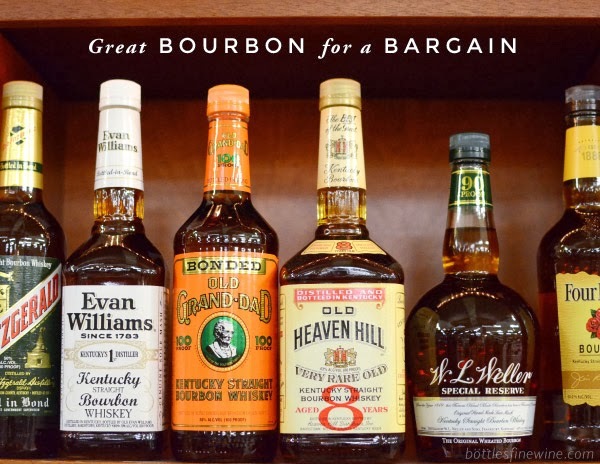 – Include handles of a few staple liquors like Bourbon, Vodka, and Rum. 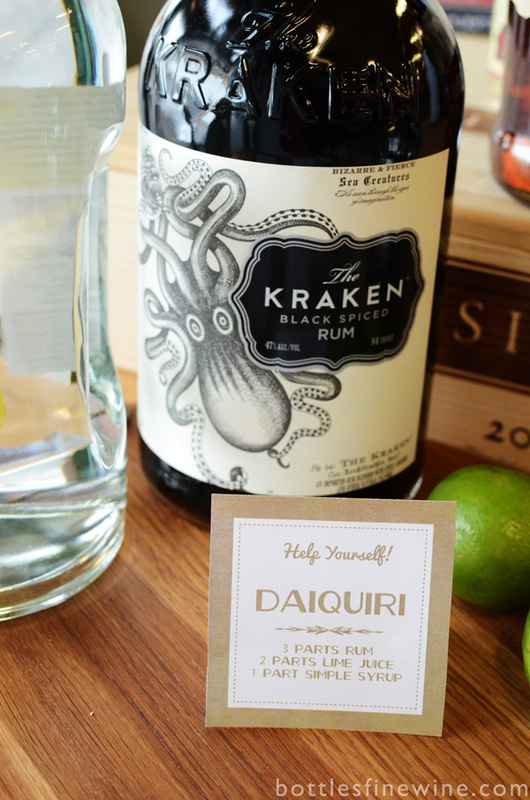 It’s time to let your guests to play bartender! Everyone has variations on how they like their drink mixed. A self serve bar with helpful cocktail recipe signs lets them make the perfect drink to their own taste. Offering simple drink recipes gives your guests ideas for what they can make. 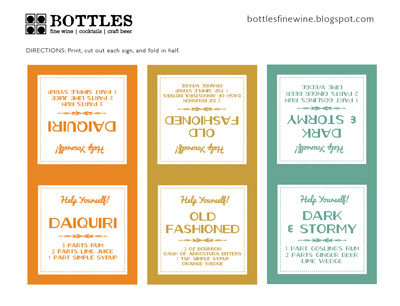 Follow the directions below to make each these 6 quick & colorful “Help Yourself!” signs. They each have an easy drink idea with a basic recipe to get them started. 1. Click the link above to download the PDF file. 2. Print out both pages on your home printer. 3. 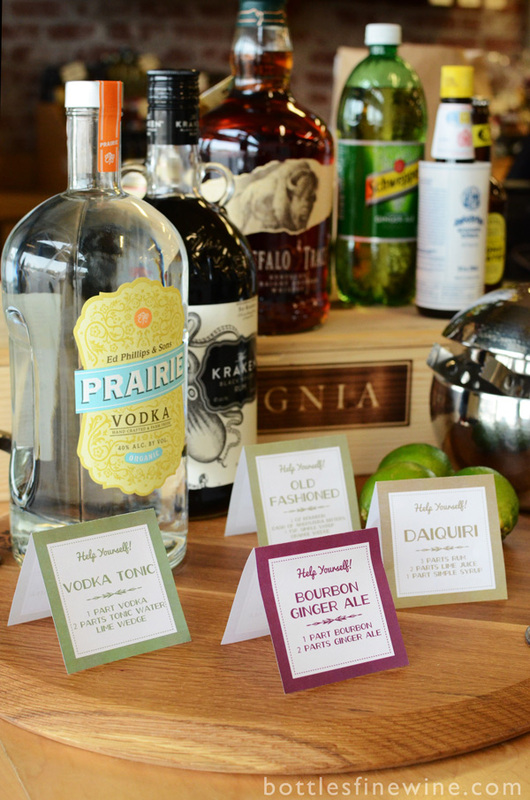 With scissors, cut out each of the 6 cocktail recipe signs. 4. Fold each in half, so that it forms a standing sign with the recipe on both sides. 5. Place at your bar! You need a PDF reader to open this download, click HERE if you need to download a PDF reader. Now that you have assembled the tools and given your guests a quick playbook, all there is left to do is enjoy the game! – Check your ice situation. Good cocktails are chilled cocktails. – Make yourself a drink! 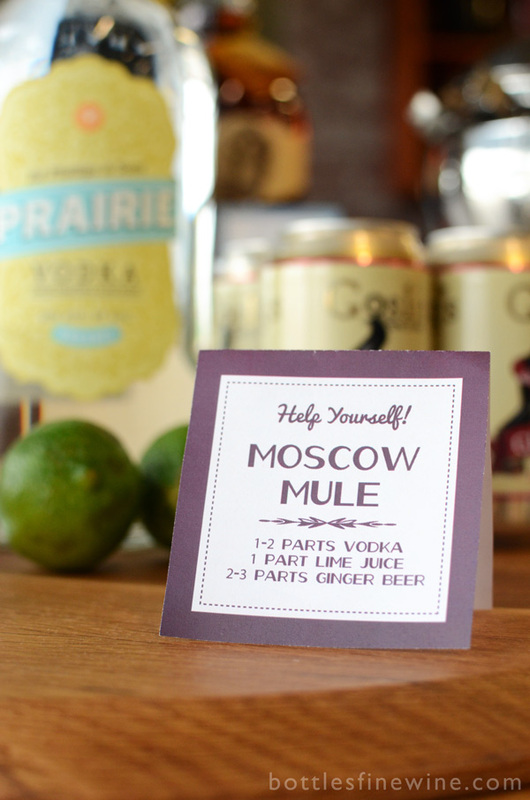 Moscow Mules were first popular in the 1950s, and are so easy to make, smooth, & refreshing, that there’s no way they aren’t making a comeback! Add 2 or 3 ice cubes to Prairie Vodka, fresh Lime Juice, and Gosling’s Ginger Beer, and then stir. There are many variations on The Old Fashioned; here’s our easy version that’s simple enough for parties that uses Buffalo Trace Bourbon and Angostura Bitters. Add an ice cube or two and stir. 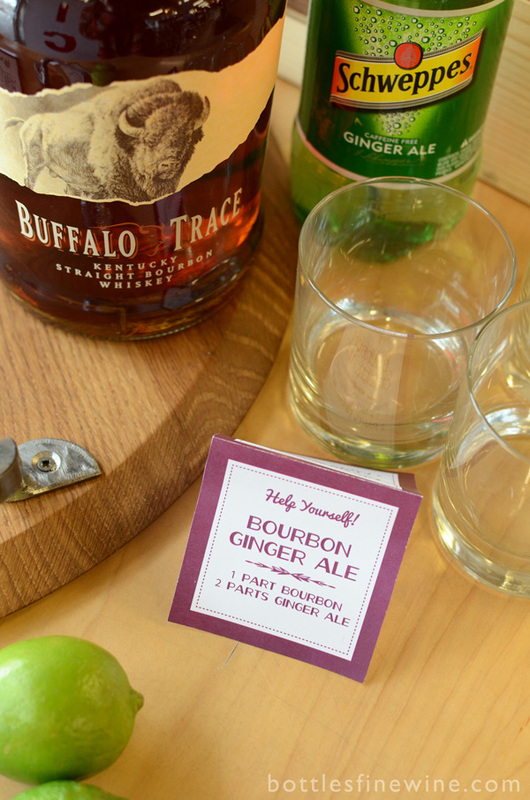 Bourbon and ginger ale go together like peas ‘n carrots! We are using Buffalo Trace Bourbon Whiskey. Use your favorite ginger ale and serve this bubbly, refreshing drink over ice. Almost everyone knows a Vodka Tonic. 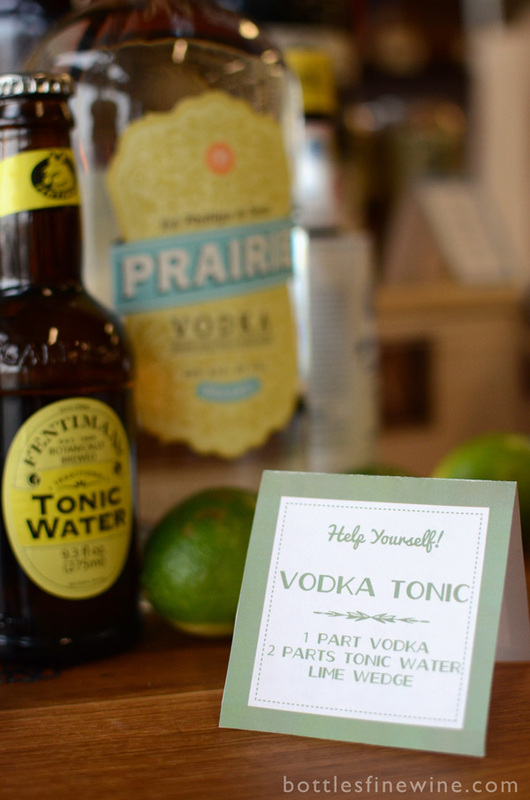 Combine Praire Vodka with Fentiman’s Tonic Water over ice, and add a lime wedge. A rum-based cocktail, Daiquiris have many variations; this is a basic version. Fill a shaker with ice & all ingredients. Shake and strain into glass. A type of highball, a Dark & Stormy is a popular cocktail in the Rhode Island area. Use Gosling’s Rum and Gosling’s Ginger Beer. Serve over ice. This entry was posted in Cocktails, Party Ideas and tagged bar, cocktail, daiquiri, dark and stormy, diy, free, idea, moscow mule, old fashioned, party, printable, recipe, self serve, sign on January 21, 2013 by bottlesfinewine.